Barbara & Gwen were sisters and their surname was Livsey, but Barbara may be best known as Barbara Blake thanks to her success in Barbara & The Uniques. 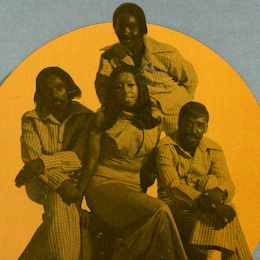 Barbara, who was born in Atlanta, GA on 27 May 1946 started out as a member of the Du-ettes in her adopted home in Chicago singing girl group pop/soul for the Leaner Brothers' various labels. At the end of the 60s Gwen joined her sister for this super one-off release for Gerald Sims and Leo Westbrook. I Love My Man is hard Windy City soul of the finest kind. Great righteous intro leads on to some tough vocals as the hymn of love works onwards. Interestingly there’s at least three voices present here – double tracking or some other singers? 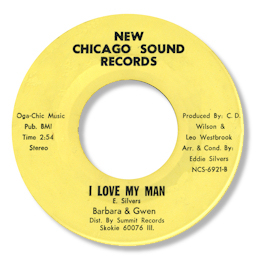 Aside from this number, the only time Barbara Blake ever scaled the emotional heights was on Bunny Sigler's excellent ballad You Got Your Hooks In Me which has long been a favourite here - preferred to the O'Jays even. Barbara's wailing in front of some super gospel harmonies from her Uniques is quite outstanding. I can’t pass up this opportunity to include it here. Note ~ I’m not at all qualified to produce a discography of all the groups that Barbara & Gwen Livsey were in but you can find a good one here from the highly knowledgeable Bosko Asanovic. Thanks to Barry Martin for the suggestion.